A $250 security deposit is required with this reservation and we will process a credit card authorization in that amount prior to your arrival. A charge may result for damage to the condo or contents, missing contents, excessive cleaning required after checkout or for exceeding the maximum number of overnight guests. Standard check-in time is 3 PM and checkout time is 11 AM. Early and late check-out may be avaialble for an additional fee. Please be certain to plan your arrival and departures days accordingly. The reservation deposit is nonrefundable; however if a cancellation is made more than 60 days prior to the check-in date, the full reservation deposit may be applied to a new set of reservation dates in the same property beginning anytime up to one year from the original check-in date (subject to availability). 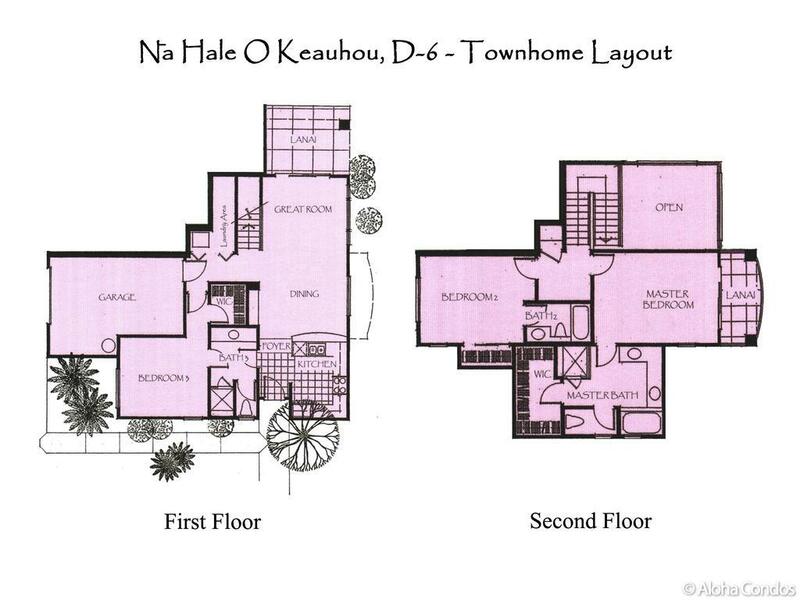 Best location at Na Hale O Keauhou and added to the website on December 18, 2014. Another great stay at D-6! This was our fourth stay at D-6. We have always enjoyed staying in this condo. Very well maintained and furnished to a high standard. The kitchen is well stocked with good quality crockery, glasses, coffee mugs, mixing bowls etc. The pantry has even lots of items that previous guests have left behind like salt, pepper, spices and seasonings, pasta and cooking oil. There is always plenty of dishwashing liquid, dishwasher cleaning agents and laundry detergent - small things that mean a lot. There are bikes in the garage for guests to use. A couple of cool boxes are provided as well as beach toys for kids, beach chairs and mats and body surfing boards.The jacuzzi in the pool area is great. We also like Na Hale O's location, walking distance to the Keauhou Shopping Center and KTA supermarket, Kahalu'u beach (probably the best snorkelling beach on the island) and Keauhou Bay (for amazing sunsets! ).We look forward to staying here again on our next visit! This is a nice house that is a 5 minute walk from the community pool. There are a lot of extras in the garage to enhance your stay such as boogie boards, water shoes and snorkeling gear. The beds were very comfortable, the washer and dryer were easy to operate and the kitchen was well stocked for cooking. The house could use some updates. The wheels on one side of the dishwasher rack were missing making it hard to load and unload. One of the chairs in the dining room table was broken. There were only 5 of us so it wasn't an issue. Other than those things we found it to be a very comfortable place. We are currently in the process of buying a new dishwasher, rather than replacing the wheels. We are unaware of the broken chair, but will fix or replace. Thanks for the message. Fiber optics have not made it to the complex yet. At this time we have the best internet connection that is available. If there are any questions regarding how anything works in the condo please let us know and we can further assist you. Beautifully appointed, quiet complex, perfect location. The unit was a perfect match for our small group: 3 bedrooms, each with its own bathroom. The kitchen was well stocked with pots, pans, dishes, and utensils. There was water activity equipment that came in handy as well as an umbrella and mats too. The location was perfect with just enough distance from the main area to keep things quiet, yet close enough to pop in anytime. One of the most convenient, excellent snorkeling areas is just minutes away down Alii road. The only negative: one of the two 1000 piece puzzles we assembled had a piece missing! Not even sure where to begin! In looking for accommodations for our visit to Kona, I was very thorough with my research. Based on location, bed/bath plans, amenities, pictures, and prior reviews, unit D-6 was an obvious choice. And we were so pleased with our choice. First of all, Ken was so helpful and responded quickly to all my questions prior to arrival. The check-in process so easy and smooth. The unit itself was very clean and very well stocked. Aside from groceries, nothing else was really needed. Every bedroom having it’s own bathroom was awesome. The master and main floor bedroom/bathroom/closet areas were huge. Plenty of room to fully unpack those suitcases and store them in the garage so you get the full effect of being ‘at home’. The grounds were well maintained and location was close enough to everything, yet far enough away to feel peaceful. We were within walking distance to both a great snorkeling beach and a boogie boarding beach. The pool/hot tub area was very nice and never too crowded no matter what time of day we decided to take a swim. My brother-in-law lives in Kona and has seen many condos/resorts while different friends or family members have been staying in Kona and he said Na Hale O Keauhou was the nicest place he’s seen. We loved our visit to the Big Island and needless to say, when we return we will definitely be booking here! This was our family’s 7th summer visiting the Big Island and we had an outstanding experience at the Na Hale O Keahou condo. Great location, near stores, beaches, coffee plantations and main roads. We appreciated that there was plenty of parking and it was near the unit. The furnishings including chairs, beds, couch and ceiling fans were comfortable. Bathrooms were clean and spacious, good water pressure. There were large closets in the bedrooms. Kitchen stocked with utensils, dishes, cups, wine glasses, bowls, containers, blender, rice cooker. We enjoyed grilling on the outdoor patio. There were beach/sands toys and equipment in the garage. We liked having the garage to hang our damp rash guards, suits and booties. We have many wonderful memories of our stay. The condo was quite well appointed although there were a few things that needed to be replaced, upgraded or renewed. It needs a general spruce up. The barbecue was old and unfit for use so that was replaced. The kitchen utensils, crockery and cutlery needs to be updated. There were several items missing. One of the bedside lights in the master did not work. It would be better if there was some rule to prevent early morning noise in the complex. There was a neighbour starting up his Harley Davidson at 6am each day which kept waking us up. Having said all that, we would rent the condo again in the future. Thanks for the comments. We have the best crew in Hawaii. They are super conscientious and always prepare for our guests to have a great vacation. This time our move in date simply missed, and this is the first time. Since flights do get delayed and are on odd schedules, we often get requests for staying late or arriving early. Our crew has always been very accommodating. Our seating on the Lanai is limited to what the association will allow. Maybe one more chair can fit, but you can always bring out the dining chairs if there are more people to sit outside. Thank you, Ken and Allie for an amazing time in your townhome!! We couldn't have asked for better accommodations in Kona! It was very clean, very spacious and it was located in a very convenient part of town minutes from the local beaches, stores, restaurants, and downtown Kona. The townhome came fully equipped with everything you can imagine including enough boogie boards, snorkeling gear, beach towels, beach chairs for a family of 5! If you are having a difficult time trying to decide which unit to rent in this complex, this is the one! It's a few steps from the pool, the gym, the gated entry, and ocean views from the master bedroom lanai. The complex is very well kept and it's very serene and peaceful. We stayed a week here and a few days in Waikoloa and wished that we had stayed in the townhome the whole duration of the trip. The beaches in this area have much better waves, and it was fun to mingle with the local community. When I arrived late afternoon at Townhome D 6, it made me feel as like being home. In the bathroom and kitchen were ready to use. Every essential things were right there to use. My son was talking about "pay foward" system and he sugested to fill all of the condiments before we leave for others. We enjoyed while we stay in Townhome D6. Comfortable location and amenities are the top quality lebel. I would like to return at same place again. I shall give a 5 stars absolutely.Thank you Ken and Bill. Na Hale O Keauhou is the best place to stay!